Joe Bradley, Biddeford, 2016, oil on canvas, 9' 4" x 11'. 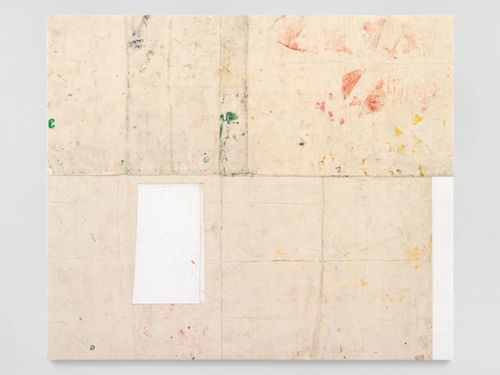 Joe Bradley continues to push the medium of painting into new semantic territories. Many of the works here consist of pieces of canvas stitched together, affixed to larger, stretched canvases. In Biddeford, 2016, four bits of stained off-white canvas cling to a cleaner, white one. Each hosts a colony of stains: red, pink, and green splotches, the aftereffects of painting, stretched to become painting itself. Then there’s Eric’s Hair, 2016: an AbEx waterfall for the neon age. The work is vertically split into two sections; the left side is further divided, horizontally, with a purer brighter white on the bottom and some raggedness on top. The right side is a gregarious splatter of tropical blues and sea greens with some electric pink and light sepia slathered on, almost as an afterthought, albeit a very wise one. In addition to the seven paintings presented here, there are also three sculptures—a departure for Bradley, in terms of both form and content. These aluminum and Plexiglas boxes, one of which is monochromatic, could be the work of Donald Judd, had he not been allergic to color. In the context of the exhibition space as a whole, they emerge as an architectural disruption—endowing the paintings with a louder irreverence that can even extend into gravitas.